I have often wondered what it would be like to be a child growing up and living at a lighthouse, with your father being one of the lighthouse keepers, and your mother running the household. Especially in the late 19th or early 20th centuries. And especially on an island. 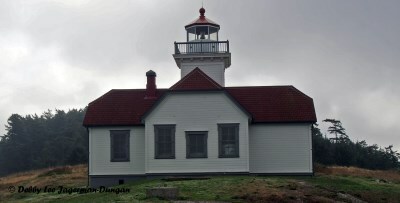 So as part of our trip to the San Juan Islands with my husband back in October, we made it a point to visit five lighthouses of the San Juan Islands. I loved visiting all of them! After spending a few days on San Juan Island itself first, visiting three lighthouses (Burrows Island, Cattle Point, and Lime Kiln), and hiking, we boarded a ferry with our car and headed to Orcas Island for another few days. 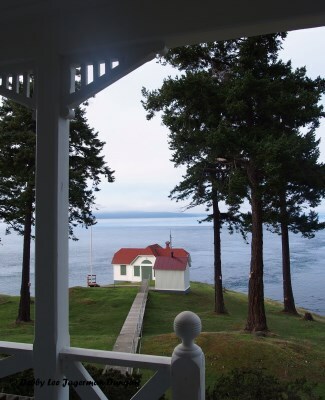 From here, we would visit Patos Island Lighthouse and Turn Point Lighthouse on Stuart Island. To get to these smaller islands, we needed to charter a boat, which I arranged before we left on our trip. I organized the excursion with Outer Island Expeditions to visit both lighthouses on the same day. Because of the time of year, Outer Island Expeditions preferred to have four people on the trip, so I recruited two family members to join us for that day. Meeting early in the morning on a Friday, my husband, my family, and I departed from Eastsound on Orcas Island and headed to Patos Island first, located five miles northwest of Orcas Island, and the northernmost of the San Juan Islands. Very fun! 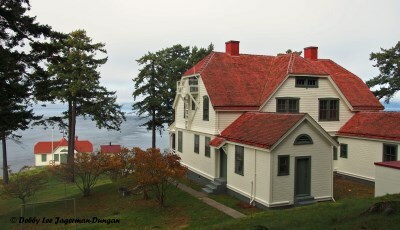 In 1893, the island came under the control of the United States, and the first light station was established. The island’s third lightkeeper, from 1905 to 1913, was Edward Durgan, along with his wife and their 13 children. One of their children, Helene Glidden, wrote a memoir of her childhood, and her life growing up on Patos Island, entitled “The Light on the Island, Tales of a Lighthouse Keeper’s Family in the San Juan Islands.” Sometimes joyous, fun, and full of picnics, other times difficult, challenging, and heartbreaking, this fictionalized account of Ms. Glidden’s life gave me some insight into my wonderment of what it might have been like to grow up at a lighthouse on an island. The Patos Island Lighthouse was automated in 1974. Today the lighthouse is part of the Patos Island State Park, which has a hiking trail, is open to boaters, and has camping and pit toilets. I read Ms. Glidden’s book after our trip to the lighthouse, and would like to go back again someday, because now I know more about the lighthouse and the island itself. After spending about an hour on Patos Island, we headed towards Stuart Island on our chartered boat. Stuart Island is located in the northwest part of the San Juan Islands, about eight miles east of Vancouver Island, Canada. 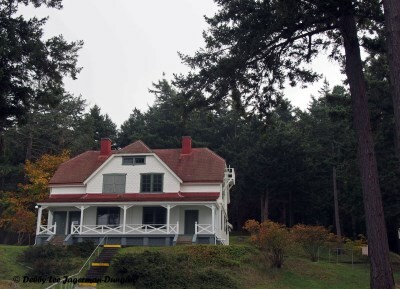 Located on the northwestern corner of Stuart Island, we visited the Turn Point Lighthouse for a few hours. Because of the time of year we visited, the inside of the lightkeeper’s house was not open for tours, but I must get back here to get inside this grand-looking two-story duplex home. As I have learned from visiting several lighthouses, one side of these homes was for the lightkeeper and his family, and the other side was for the assistant lightkeeper and his family. 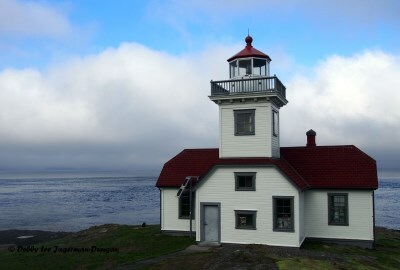 The Turn Point Lighthouse was built in 1893, and began its operation in November of that year. In 1895, before becoming the lightkeeper at Patos Island, Edward Durgan was the lightkeeper of Turn Point, although Ms. Glidden was not yet born. Turn Point was automated in 1974, and the lightkeeper’s house has more recently been used by researchers from the University of Washington to study whale migration. Today, the light of Turn Point Lighthouse flashes white every two-and-a-half seconds, and is part of Stuart Island State Park. Did you know that according to the Lighthouse Directory from the University of North Carolina at Chapel Hill there are apparently more than 17,200 lighthouses in the world? Oh, how I would love to visit them all. 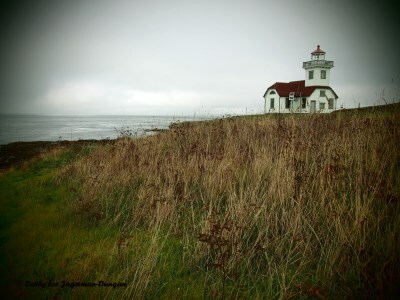 For now, the five lighthouses of the San Juan Islands, along with two on the Washington Coast, ten on the Oregon Coast, and a few that I have not yet written about, including one that my now-husband and I recently got married at!, are part of my growing list of lighthouses that I have visited. Debby loves to walk at home…and when she travels. Recently returning from walking the majority of 482 miles of the Camino de Santiago across northern Spain (plus an additional 20 miles along the Atlantic Coast), she has also trekked to Laya in Bhutan at 12,500 feet, backpacked the Wonderland Trail around Mt. Rainier, ambled around the Cotswolds in England, and is one of the few to walk Île d'Orléans near Québec City, Canada. Debby has also journeyed from the Galapagos Islands to Punxsutawney, PA, and enjoys exploring lighthouses. She has created her favorite subject to photograph when she travels, windows and doors, into five books, including places from the Cotswolds to the Camino, from Île d’Orléans to Porvoo, and ten countries in between. All books are available on Amazon, with links below. If you'd like to contact Debby, please email her at debbysdepartures[at]yahoo[dot]com. Unless specifically mentioned, all images on my Debby's Departures blog and my previous blog, Tea, Sugar, a Dream, are my own original photographs and, therefore, are copyright protected (©Debby Lee, Debby Lee Jagerman, Debby Lee Dungan, or Debby Lee Jagerman-Dungan). Feel free to use my images for non-commercial use so long as you give me credit and let me know via email. Likewise, feel free to pin my images to Pinterest, but please mention me by name. For other inquiries, contact me at debbysdepartures(at)yahoo(dot)com. Thank you! Sweet Travels!